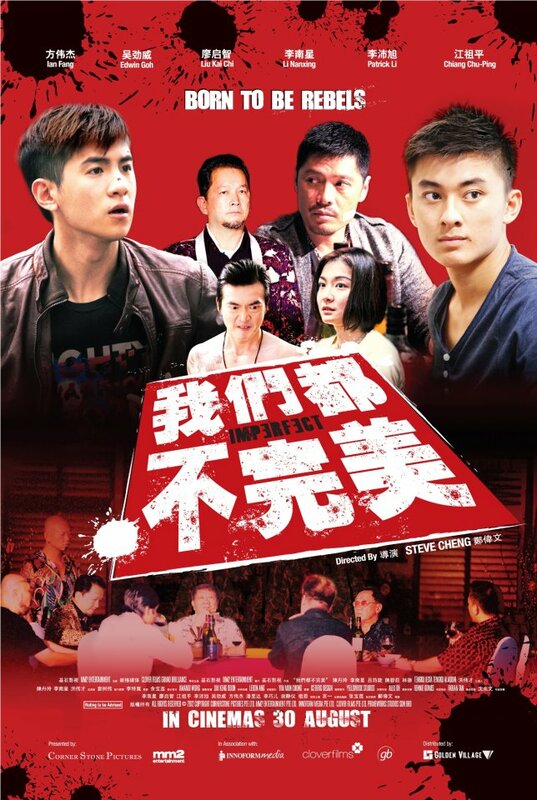 Starring HK veteran actor Liu Kai Chi 廖启智, Taiwanese actors Patrick Li 李沛旭 and Chiang Chu-Ping 江祖平, Singapore’s Li Nanxing 李南星, Edwin Goh 吴劲威, Ian Fang 方伟杰, Kimberly 谢静义etc, the movie is about two young guys who are caught in between two triads and how are they able to get themselves out from the bloody feud. Jianhao, Zach and Square are best buddies who were forced to separate when Jianhao was sent to a Boys' Home after hurting someone in the course of protecting Zach. Jianhao's mother Huifang was devastated. After Jianhao's term at the Boys' Home, Huifang arranged for him to help out at her stall in Bugis. With the encouragement of his girlfriend Shan Shan, Jianhao decided to retake his 'O' levels. However, Jianhao's attempts to have a fresh start are short-lived. He is forced to join the triad with Zach and Square when Alex, their arch-rival, who is also the son of triad leader, Guodong, make them his targets. During a gang fight, Jianhao ends up saving his leader, Zhihua, which leaves him in his debt. Jianhao will soon need Zhihua to repay him when Zach and Jianhao injure Alex severely, leaving him comatose, and Guodong is determined to avenge his son. They become fugitives overnight, and with Guodong and the police racing to capture the trio, will Zhihua come to the boys' rescue? Just look at the crowd! Waiting to see their favourite stars. Some photos of the stars walking on the red carpet! Our media spot got occupied by another group of teenage fans. Some fanclub if I'm not wrong. So no good view cause by the time I reached it was very very crowded already. The young stars on stage. Group photos of the cast! The movie was not bad. I would recommend you all to go and watch it. True that it's the typical type of family touching type of movie that you can predict what will happen. Oh! And the movie is NC16! My sis got stopped to ask if she was above 16 lols. Shall end off this post with a song! Kinda like this song lols. They played this song on repeat in the theatre before the movie started. IMPERFECT is out in the cinemas today! Younger sis just brought my grandma to watch it in the cinema cause we recommend them to watch it!